Well I feel inspired today to talk about a really cool aspect of some plants. That is, the ability of the plant's sap to affect you in more way than just poison ivy, where the chemical urushiol causes the probably-familiar skin reaction of itching, rash, and possibly gooey filled blisters. What I'm referring to is phytophotodermititis. 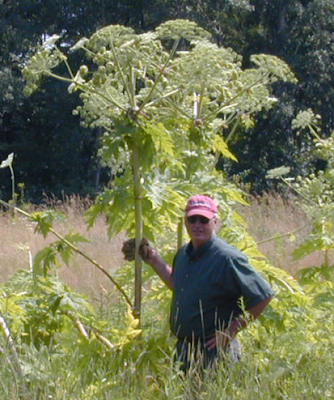 Take for example, the Giant Hogweed (Heracleum mantegazzianum). This plant resembles one you might know- Queen Anne's Lace, that delicate white "weed" growing roadside, though this one looks like it's on steroids. 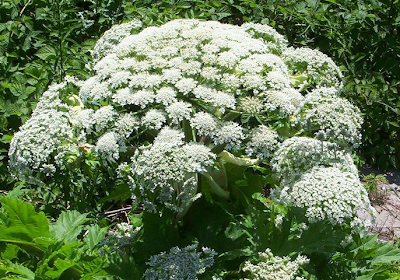 It's significantly larger, though still possessing the broad flat-topped umbrel of the Queen Anne's Lace. So anyway, if you see this plant, stay away. 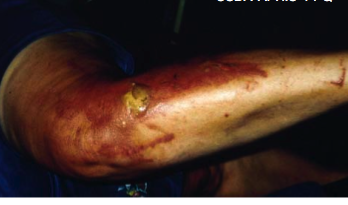 Reaction occurs "when the skin is exposed to sunlight or to UV-rays. Initially the skin colors red and starts itching. Then blisters form as in burns within 48 hours. They form black or purplish scars, which can last several years. Hospitalization may become necessary. Presence of minute amounts of sap in the eyes, can lead to temporary or even permanent blindness. These reactions are caused by the presence of linear derivatives of furocoumarin in its leaves, roots, stems, flowers, and seeds. These chemicals can get into the nucleus of the epithelial cells, forming a bond with the DNA, causing the cells to die. The brown color is caused by the production of melanin by furocoumarins. In Germany, where this plant has become a real nuisance, there were about 16,000 victims in 2003." If you're exposed to these chemicals, wash vigorously with soap and water and protect the area from sunlight. This concludes my plant Public Service Announcement.